In sizes between 1.6 and 2.9 cm, (0.6 and 1 inch)that is 1:10 / 1:12 scale. 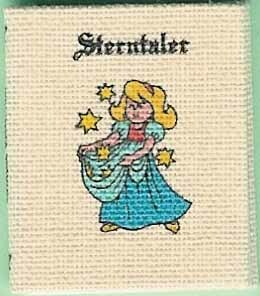 Fairy tale, picture books classic literature, non fiction books. Currently 34 titles are offered, more will follow. The books are designed by me, some inspired by old original works. Type fonts, illustrations, endpapers, book covers and colour concept for each book are carefully selected to achieve a harmonic appearance. Most of my book blocks are glued, some stitched. The books are hardbacks, hand bound in cloth, paper, half cloth or half leather. I like to experiment and always look out for new materials and design ideas. 2002, 22 pages, 2.5 x 2 cm, red cloth and dust cover with picture.First edition limited to 25 signed copies. $17 O. 2000-2002, 14- 22 pages, 1.6 - 2.4 cm. Each $7. 2002, 47 pages, 2.6 x 2.1 cm, 2 nostalgic b/w graphs, bookmarker, Half leather binding, light cloth, brown rounded spine. Limited and numbered edition of 50copies. $16. 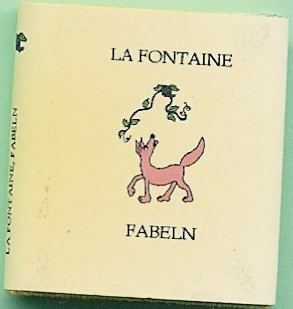 2002, 26 pages, 2.4 x 1.9 cm. 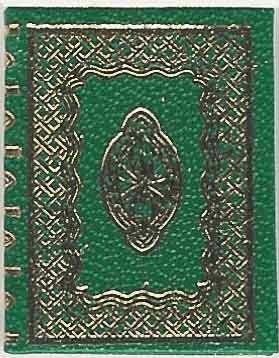 Moss green cloth binding with gold coloured metal ornament, marbled endpapers, First edition of 20. $19. 2002, 31 pages, 2.9 x 2.3 cm green paper binding (leather look) and overall gilt stamping. 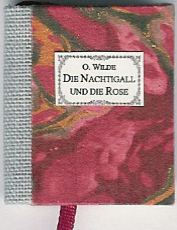 First edition 25 pieces. $20. 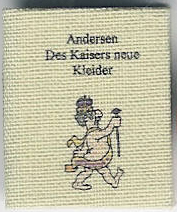 2002, 36 pages, 2.5 x 2.1 cm, 2 coloured illustrations. Half leather binding, cover with red/gold/brown marbled paper, bookmarker. Spine in different variations. 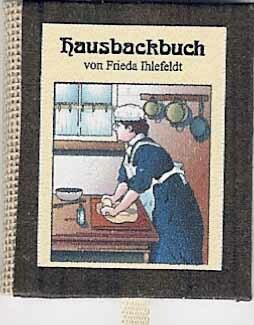 Label with author and title. $17. 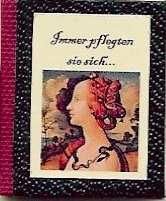 2002, 31 pages, 2.6 x 2.2 cm. 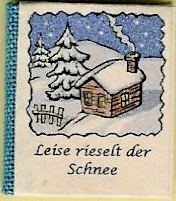 Christmas book, words of 11 famous old folk songs, 9 coloured nostalgic illustrations. 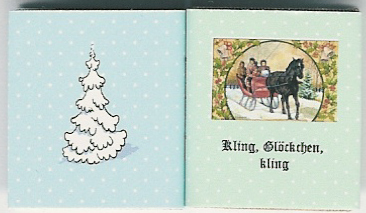 Rounded spine, beige cloth binding with winter/ Christmas motif, jacket with various Christmas motifs. $15. 2000, 32 pages, 2.6 x 2.2 cm, ruby red/ moss green cloth, about 8 little shiny pictures, sewn. Each book is different. 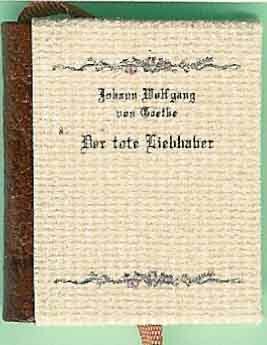 after an old model2002, 62 pages, 2.5 x 2.1 cm. Half cloth binding, spine beige, cover with glued hand coloured brown paper. Bookmarker, 8 nostalgic b/w illustrations, 40 recipes. $16. If you are interested in more about my books, please order my German catalogue with illustrations of all editions and some text samples. ($3 for airmail to USA/Canada). I ship by airmail in bubble-envelopes, charges for shipping and handling are$ 3 for 1 book, $ 6 for 2 - 5 books, $ 13 for 5 - 10 books.